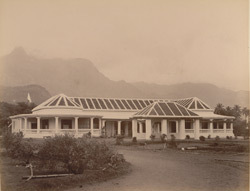 Photograph taken about 1900 by the Government photographer, Zacharias D'Cruz of the Bungalow at Kuttralam, in the erstwhile Travancore. It is one of 76 prints in an album entitled 'Album of South Indian Views' of the Curzon Collection. George Nathaniel Curzon was Under Secretary of State at the Foreign Office between 1895-98 and Viceroy of India between 1898-1905. The famous Kuttralam falls is situated close to the town of Shencotta, now in Tamilnadu (but which used to be part of the Travancore State). An important centre of trade, it also boasts of a sanatorium, a Shiva temple and a choultry that was maintained by the Maharaja of Travancore.